In medium bowl, combine vinegar, brown sugar, red pepper flakes, Worcestershire sauce, salt and hot pepper sauce. Divide sauce into two portions; set aside. At least 1 hour before grilling, soak wood chips in enough water to cover; drain before using. Rub meat with salt and black pepper. In a charcoal grill with a cover, place preheated coals around a drip pan for medium indirect heat. Add 1/2 inch hot water to drip pan. Sprinkle half of the drained wood chips over the coals. Place meat on grill rack over drip pan. Cover and grill about 4 hours or until meat is very tender. Add more preheated coals (use a hibachi or a metal chimney starter to preheat coals), wood chips and hot water every 1 to 1 1/2 hours. Remove meat from grill; cover with foil and let stand for 20-30 minutes. Using a fork, shred meat into long, thin strands. Pour sauce over shredded meat; toss to coat. 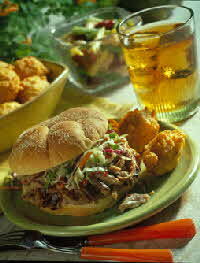 If desired, top meat with coleslaw. Serve remaining sauce on the side. Cooking this roast long and slow makes for a tasty, tender sandwich. Top the sandwich with some coleslaw for a crunchy, cool contrast. Have your favorite side dishes and some cold watermelon for dessert.